The S&P 500 started the week on a neutral day and the S&P 500 basically closed flat on Monday. On Tuesday, the morning was controlled by the bulls and it looked like they were going to pull off a nice break to the upside, but the bears had different plans as they pulled the S&P 500 to a lower close. Wednesday was the days the bulls fought and clearly won giving them good footing for Thursday. However, they could not do it. Thursday and Friday were days of the S&P 500 opening lower, trading lower throughout the day, but the bulls being able to pull the S&P 500 higher back towards the lower opening price. It was a week of much back and forth sideways action between the bulls and bears. Below is a daily chart showing all the back and forth action between the bulls and bears. What a week. The S&P 500 broke to new highs and closed lower for the day on Tuesday leaving the door open for the bears. The price action is heated in this area. The bears see this as a false breakout or a weakening of the bulls. The bulls see this as a small pullback from resistance and a pattern that could be materializing as a cup and handle. 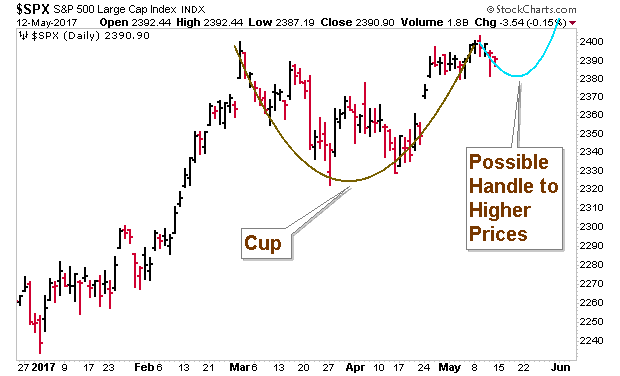 Below is an illustration of the bullish cup and handle formation. The bulls have momentum on their side and they are close to resistance. The more time price spends around support or resistance, the more likely it is to break. The bad news for the bulls is that the longer price stays stagnant (or sideways), the less influence their past bullish behavior has on price. Said another way, they are losing momentum more and more as prices stay neutral. We will be watching to see if the bulls can get a break to the upside or the bears can hold the line at the current resistance area of 2400. Breadth has moved down with price action this week. 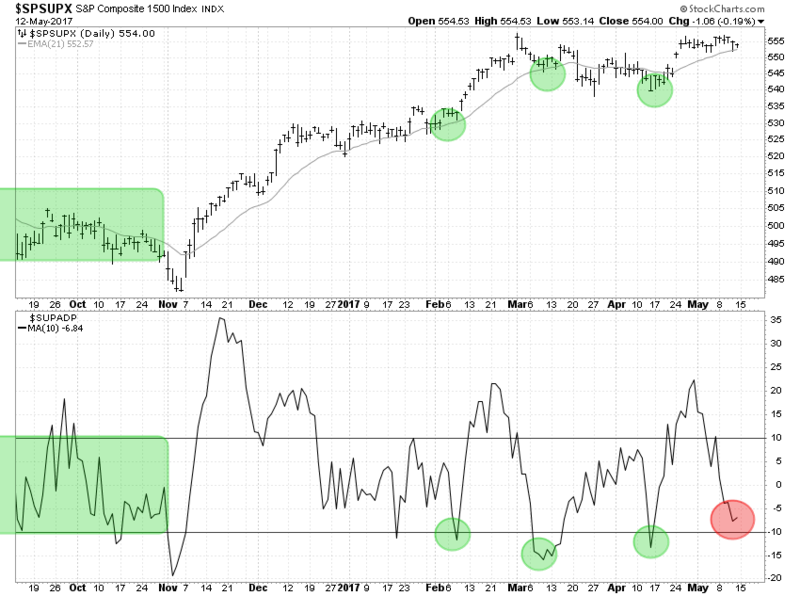 The faster breadth oscillators have become oversold. The past few times the faster oscillators have become oversold, the S&P Composite 1500 Index has bounced higher in different degrees. See the green dots below. The red dot is currently in question. That is what should happen in a higher trending market. When a market is trending higher, an oscillator’s oversold signals are usually good signals while the overbought signals are typically less desirable. In a downtrend, the oscillator’s overbought signals are typically better than the oversold signals. We don’t know if this signal will be valid, but it does have potential as a valid oversold signal. The big economic news scheduled for this week is Housing Starts. The numbers scheduled for release on Tuesday at 8:30 CST are expected to be positive. The long-term trend is up along with the short-term. The bulls are still in a good place to break out higher this week even though the bears were able to hold the bulls this week after a new high. 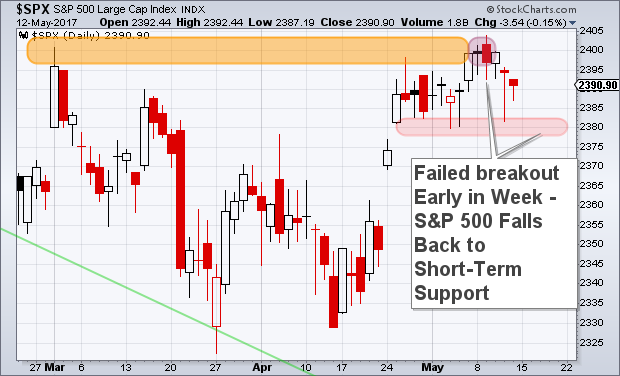 The level to watch on the upside is 2400 in the S&P 500 and there are several areas of support levels on the downside. One of the major support levels being the 2300 range as that is where prices broke out in mid-February earlier this year. We will be watching them all!